I’m a huge fan of the Michelin restaurant guide: yes, it’s not perfect, but when it comes to Italy’s restaurant scene, it’s one of the few, and relatively safe, tools at your disposal. So it pains me to start complaining about it right off the bat: but I have long thought that the two stars Michelin awards Concesio’s Miramonti l’Altro restaurant is one star short. Especially given the three stars awarded to some vastly overrated Italian stops. 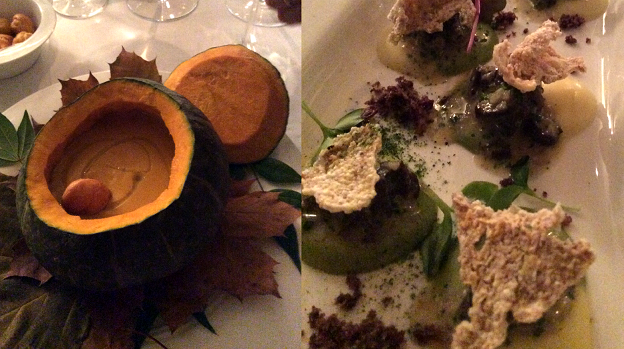 Never mind: what wine loving sybarites and Vinous readers need to know is that my most recent meal there confirmed, once again, Miramonti l’Altro as one of Italy’s most outstanding dining and watering holes. It delivers a dining experience devoid of gimmicks and faddy ingredients, relying on high quality sourced foodstuffs, precise cooking and outstanding culinary technique, plus one of Italy’s most insightful and fairly priced wine lists. Bravi! After a delightfully delicate amouse-bouche of capers, marinated anchovy, herring caviar, and a mix of fresh and crispy leek from Cervere (which actually tastes much better than it sounds), Tiberio’s 2012 Trebbiano d’Abruzzo Fonte Canale started off dinner in fine style. This is only the second vintage of this wine, made from sixty year old vines of authentic Trebbiano Abruzzese (much of the so-called Trebbiano Abruzzese growing in Abruzzo today is actually a mix of altogether different varieties such as Mostosa, Bombino Bianco and Passerina –not to mention the much lower quality Trebbiano Toscano- that have long been confused with the real thing). The Fonte Canale is a marvelous unoaked wine not unlike a grand cru Chablis. Blessed with sneaky concentration and depth, it begins minerally and citrus, then turns nutty and becomes extremely complex, with more than a passing resemblance to Valentini’s fantastic Trebbiano d’Abruzzo, perhaps Italy’s greatest white wine. I sat back and marveled at how the Fonte Canale had changed after thirty minutes in the glass, a metamorphosis that allowed it to match perfectly with each of the raw meat salad, vineyard snails and European-styled pumpkin soup (less sweet and less dependent on cinnamon and nutmeg than some similarly wonderful Canadian and Eastern US versions I have enjoyed over the years). Given the aforementioned Chablis reference, I couldn’t resist picking Raveneau’s absolutely fabulous 2010 Chablis Butteaux, a premier cru he excels with, and putting it up against the upstart Italian wine. Yes, I realize I was cradle robbing here as this is built to age. Still, this Chablis is mesmerizingly good already, offering a tight, extremely pure core of white peach, lime, vanilla and white flowers, with bright, harmonious acidity neatly extending the fruit and floral flavors on the back end. A sublime premier cru, it also matched well, if differently from the Trebbiano d’Abruzzo, with the first three dishes. Label drinkers will scoff at me when I say that I have had fewer better wines this year than Ermanno Accornero’s delightful 2012 Grignolino del Monferrato Casalese Bricco del Bosco, an absolute gem of a wine. But less is often more, and this pale red, light bodied beauty is marvelously perfumed and refreshing, a paragon of balance delivering boatloads of flavor for a song. 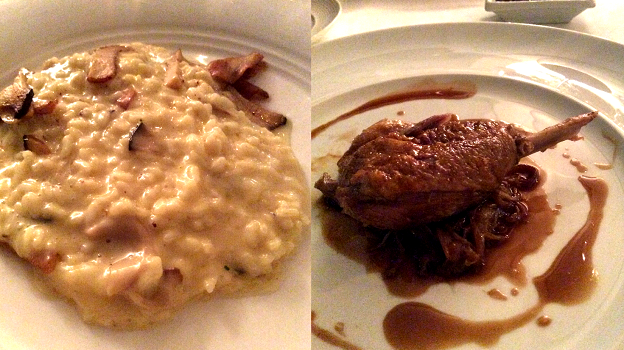 It really cut through the amazingly rich risotto that was heaped onto my plate (dish of the night, folks!) providing lift and nuance to what might have been something almost too rich for its own good. Longtime IWC readers know, and now Vinous readers do too, that I believe Tenuta San Guido’s 1985 Sassicaia to be one of the two, maybe three, best wines ever made in Italy. Unfortunately, the 2000 Sassicaia is not quite up to that level (few wines, and not just Italian, are) as the hot growing season didn’t allow for full physiologic ripeness of the Cabernet Sauvignon and Cabernet Franc polyphenols. Matched with food however, the green, bell peppery nuances are softened by the marvelously concentrated, succulent duck preparation, which needs a big, structured wine to stand up to it. Oriental spice echoes in the dish also help to nicely focus the peppery spice and sandalwood nuances of the Sassicaia. Obviously believing that my girth meant I required still more food, our server charmingly popped by with a spoonful of warm, creamy multigrain polenta and a richly luxurious, melt-in-your-mouth cotechino that had me thinking I really needed to come back the next day just to eat more of it. I called the evening a wrap after eyeballing one of the richest and highest quality assortments of artisanal cheeses ever in an Italian restaurant, and a wonderfully rich but refreshing vanilla ice cream that would have had any self-respecting child clamoring for thirds, not just seconds. Had I had more room left to eat, I would have gladly joined them.